“Bangladeshis are great spenders,” the High Commissioner said. the moment disaster warnings are received. cyclone shelters with separate shelters for men and women. seriousness with which the task is viewed. Colombo began looking to Bangladesh for a model to meet the menace. Orders works,” the High Commissioner said. 180 million people are online mostly through smart phones. the largest pool of ICT freelancers. registered teachers in a unique distant learning system for adults. The aim is to enroll 900,000 teachers in this portal, Hamidullah said. valuable services to the poor in the rural areas. Bangladesh has had a role in effecting agricultural innovations also. has itself done so, Hamidullah said. saline resistant varieties that could be cultivated in coastal areas. can be used in the dry zones of Sri Lanka like the Northern Province. agricultural research institutes,” the High Commissioner said. 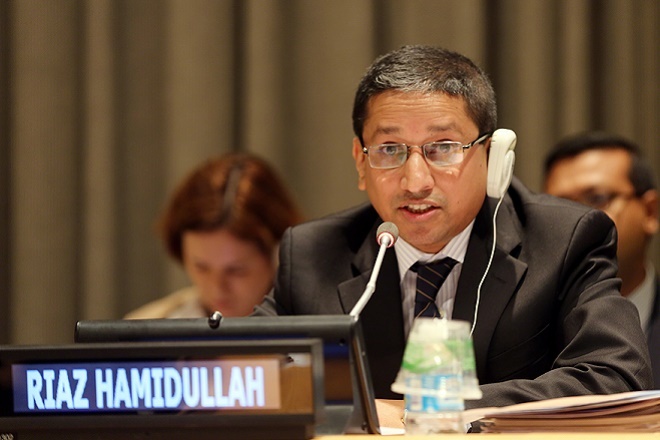 Bangladeshi homes use solar energy, Hamidullah said. enormous. Up to April 2017, bilateral trade was only US$ 79.8 million. imports from it was worth US$ 42.3 million. vegetables and live animals and animal products. are working there remitting money back home,” he said. side,” the High Commissioner pointed out. reticence about sharing,” he regretted.